In the wake of the global financial crisis, monetary and fiscal policies were used aggressively to counteract the effects of the crisis on economic activity. Policymakers look at a number of indicators to guide them in assessing an economy’s level of activity relative to its productive capacity. But trying to figure out the position of the economy in real time is often quite challenging, with consequences for setting policy. Obviously, they didn´t look at the one that “tells it all”! 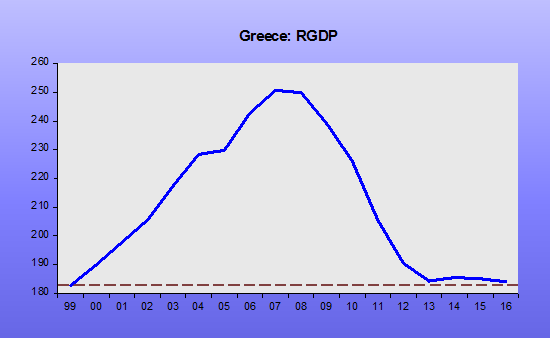 That´s NGDP growth falling way below trend! 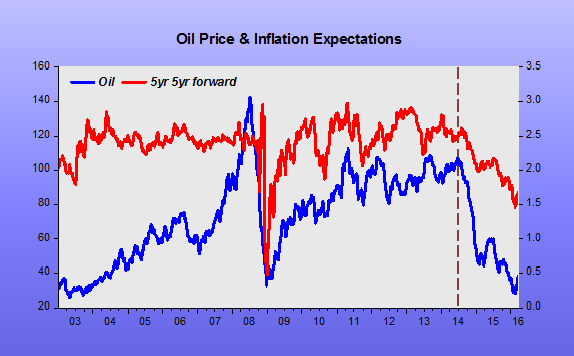 The IMF Tells the Bank Of Japan To Hit The Gas? What About The U.S. Federal Reserve? The International Monetary Fund on May 22 badgered the Bank of Japan to adopt a more-aggressive growth stance, even though the island nation posted Q1 real GDP growth of 2.4%, and an annual inflation rate of 2.3%—along with an unemployment rate of 3.4%. Moreover, under the leadership of Governor Haruhiko Kuroda, the BoJ is buying about $83 billion in bonds a month, a quantitative easing program equal in size to that of the U.S. Federal Reserves’ Q3 at its peak—except that Japan has an economy one-half the size of the United States. Fair enough. Maybe the BoJ needs to really pour it on. Um. What About the Fed? 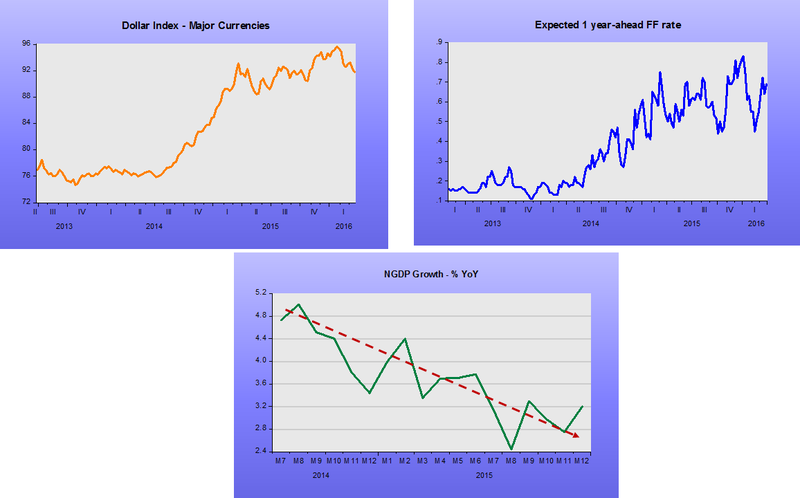 So, the United States’ posted Q1 real GDP dead in the water, and many are forecasting Q2 not much better. The core PCE deflator is now running at 1.3% YOY, with headline deflation, and the Fed has not reached its 2% inflation target for seven years, except once, and that fleetingly. 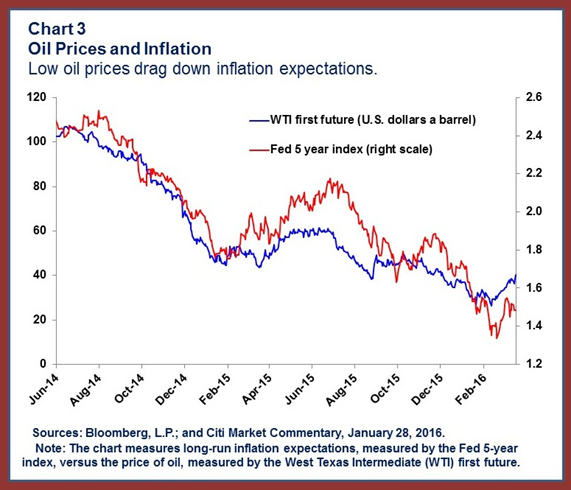 The U.S. producer price index has been in deflation for several months. The U.S. unemployment rate is 5.4%, and a squishy figure at that. BTW, also from the Fed: “Industrial production decreased 0.3% in April for its fifth consecutive monthly loss.” Capacity utilization is at 78.2%, below the long-term average. Yellen has new definition of “overheat,” and that is any room temperature warm enough to melt ice cream. And the IMF…well, what can you say. They appear seriously confused. The International Monetary Fund’s spring meetings are turning into a depressing affair. By April every year in the wake of the financial crisis, it seems the world’s top finance officials and central bankers are busy revising down expectations for annual growth and navigating some brewing financial storm. And so it is in 2015. Washington’s cherry blossoms are in full bloom and so is economic angst and frustration. 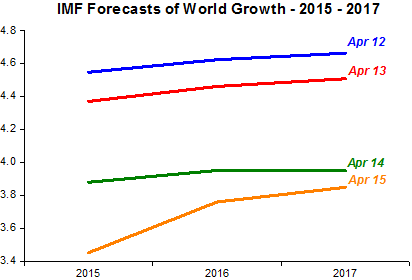 Unfortunately, world growth forecasts are still “shrinking”, so it “could get worse”! The focus of our conference will be instead on the architecture of policy when (hopefully) policy rates have become positive again, and most countries are growing and have stabilized debt-to-GDP ratios. 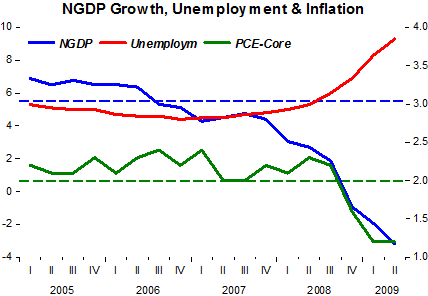 In other words, how will/should macro policy look once the crisis is finally over? Economists are fast getting into the fiction business!